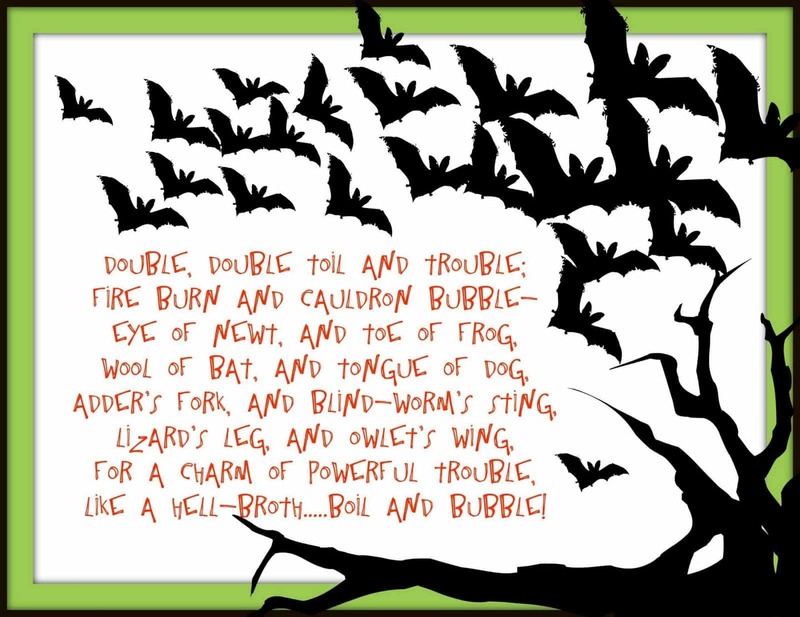 Spooky Shakespeare: The Shakespeare Halloween Edition! 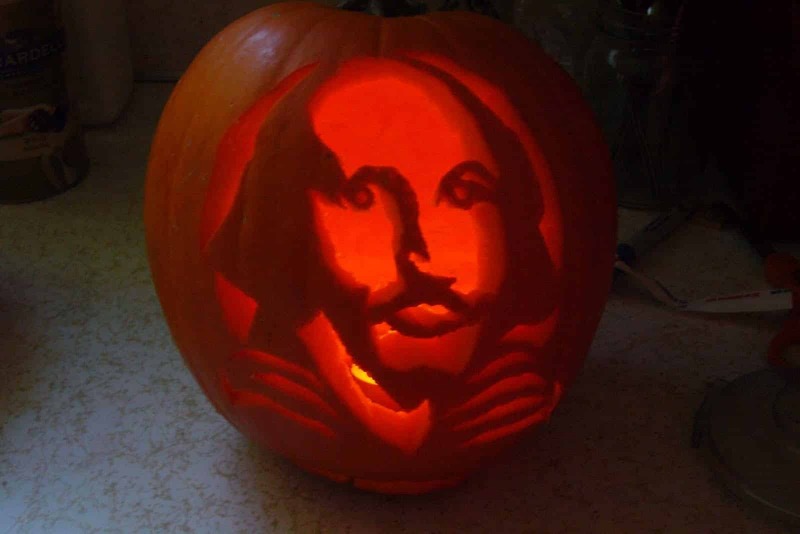 You are here: Home / Blog / Fun / Spooky Shakespeare: The Shakespeare Halloween Edition! 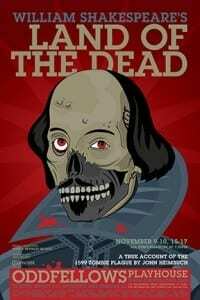 This is a rather natty poster featuring Shakespeare with a decomposing face, to promote a play at the Oddfellows Playhouse about the outbreak of a plague in 1599. 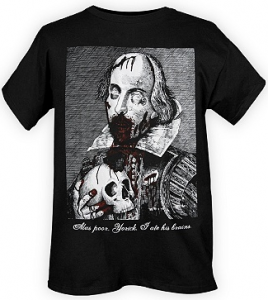 Take Shakespeare the zombie out and about with you with this Shakespeare zombie tshirt, showing a side of Shakespeare we never knew existed! “Alas poor Yorick I ate his brains”. Gory stuff! The witches spell is an all time spooky classic, and sets the Halloween scene perfectly: “A dark Cave. In the middle, a Caldron boiling. Thunder. Enter the three Witches.” You know the rest! It wouldn’t be a Shakespeare Halloween blog piece without a pumpkin. The Pumpkin Lady website has loads of great pumpkin carving patterns, including this one that doesn’t do too bad of a job of representing the visage of the world’s finest writers on a large orange vegetable. 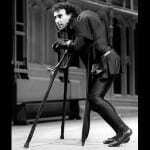 What’s your take on spooky Shakespeare? Got a favorite scary Shakespeare quote or character? Share in the comment section below. https://www.nosweatshakespeare.com/wp-content/uploads/2012/10/shakespeare-land-of-dead.jpg 432 288 warren king http://www.nosweatshakespeare.com/wp-content/uploads/2014/01/nss-logo.png warren king2012-10-30 00:05:102013-10-27 15:56:04Spooky Shakespeare: The Shakespeare Halloween Edition! own blog soon but I’m having a hard time making a decision between BlogEngine/Wordpress/B2evolution and Drupal. The reason I ask is because your design and style seems different then most blogs and I’m looking for something unique. 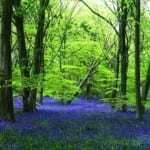 Hi Manie, the platform is WordPress and it’s a custom theme.